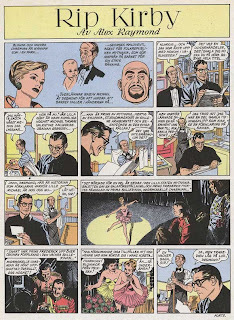 Sekvenskonst: Alex Raymond's Rip Kirby Sundays! Patsy Jan. to July 1939 scanned. Calling all Adv. of Patsy collectors. 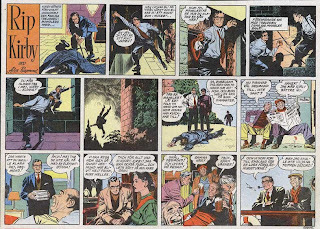 Alex Raymond's Rip Kirby Sundays! For the fans of Hedvig. But, of course, there never was any "Rip Kirby" sunday page. So there were actually "Rip Kirby" sundays! How could this be? Well, I guess that you already have figured out what I as a ten year old kid didn't get. All those beautiful color pages (Wich I tore out from the magazines and saved like a national treasure...) were re-formatted dailies. But still, these gives us a glimpse of what could have been. Later the weekly "Allers" picked up Rip and published it in the format you see below. Still in the form of a "sunday". They continued with Prentices version in this format well into the 60's I believe. 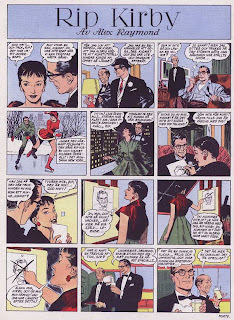 Watch this blog later this weekend for Alex Raymond's mystery strip: "Red Race". Never heard about it? Don't worry. Very few have. But soon you'll be the envy of your friends and colleauges with the facts you'll find about it here. Stay tuned, as they say. And a pretty creditable job of coloring they did! Really nice pages. Raymond is truly the master. Each panel is a work of art by itself with the attention to detail and refined elegance. "Alex is the man" as Swedish 60's pop icons Ola & the Janglers stated. Thanks!